Today’s feature from the Santo Domingo collection is both a rare volume and an artifact of the fraught history of the opium trade in China. Convened in the 1890s, the Anti-Opium League was part of a movement on the part of American and British Protestant missionaries in China to generate public sentiment against opium and to advocate for its prohibition, partly by gathering evidence of its harmfulness. 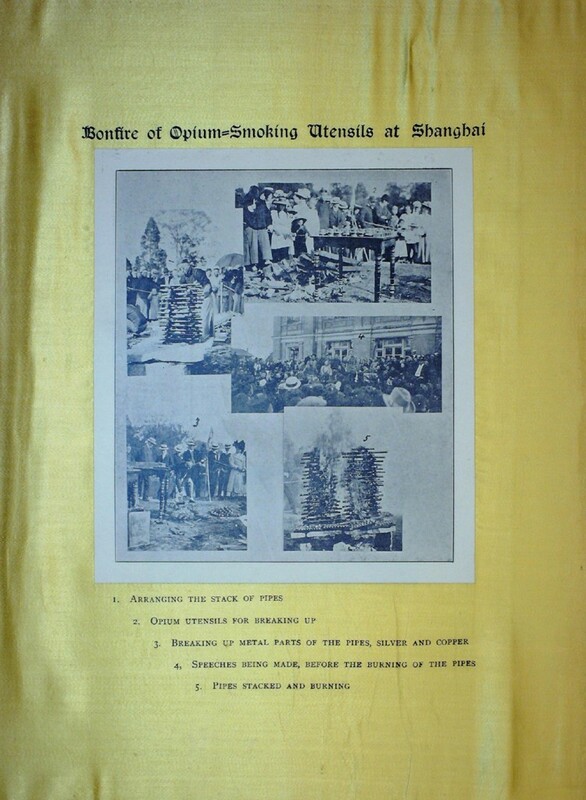 The publication shown here, The greater year of anti-opium, was written by League member Stephen Leech and issued in 1909. It reflects optimism on the part of the League that governmental steps toward prohibition were in motion. 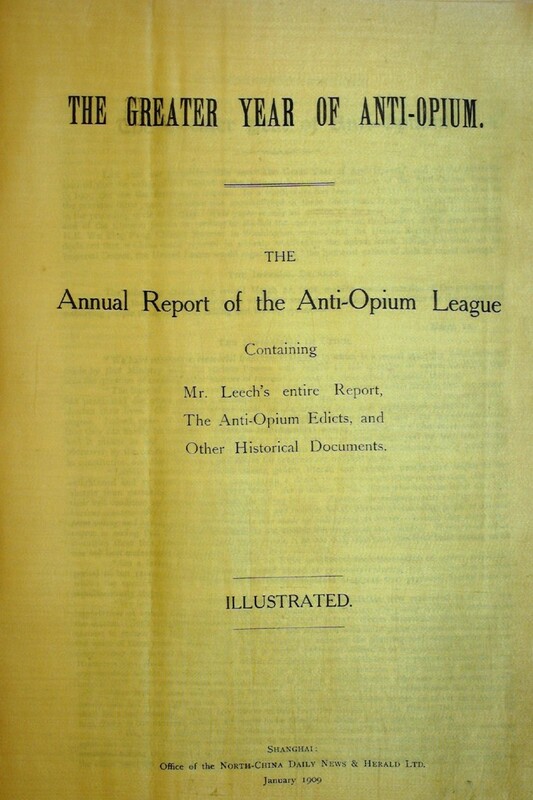 The publication succeeds a prior one, The great year of anti-opium, and the change in title reflects Leech’s perception of an accelerating pace of anti-opium activity. The report consists of a recounting of that activity, as well as accounts of changing public opinion toward opium in China’s various provinces and other pertinent data. An illustration documents the destruction of a collection of opium paraphernalia. This anti-opium movement was born not only of moral concern but also of a sense of national responsibility – England had for decades dealt in a lucrative opium trade from colonial India to China, and had gone to war with China to ensure that it persisted. Amid rising criticism, the British Government convened the Royal Opium Commission of 1895; it concluded that opium was unharmful and that the Chinese people were concerned for their economy rather than their health. This was another of many setbacks in combating not only the deleterious effects of opium in China, but also European complicity in the trade. It wouldn’t be until the mid-twentieth century that the practice was largely eradicated in China. Accompanying this copy of the report is a typescript presentation letter; the presenter and recipient are named but not presently identified. 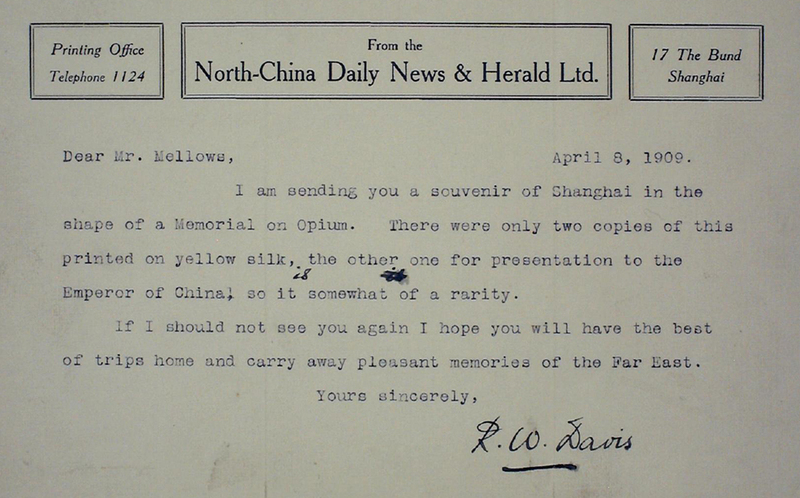 The letter indicates that this copy is one of only two printed on brilliant yellow silk; the other, apparently, was presented to the Emperor of China.